Subaru is a young man trapped in a fantasy world, just like in those novels and manga he used to read back in Japan. Excited and perplexed about his sudden turn in fortunes, he accidentally waders straight into a group of thugs, before being saved by a haughty, silver-haired half-elf. Tagging along with his new savior and semi-willing companion who is tracking down a stolen object, Subaru soon finds himself in some deadly peril, peril which he might not be able to escape from. That is at least if Subaru didn’t have more than one life to live. Sometimes when experiencing an adaptation, there’s a feeling that you get that “this story really wasn’t designed to be enjoyed this way, was it?” While, that feeling can be put to good use for comedic parody, when felt reading more more serious, straightforward adaptations the feeling is less kind, and it is exactly that second kind of disappointed, not-quite-right feeling that reading volume 1 of the Re:Zero ~ Starting Life in Another World gives me. The largest contributor to this disappointment, is the art of the Manga. Daichi Matsuse has a competent, if overall bland drawing style that is just perfunctory enough to convey the story, without adding to the written material. The characters feel stiff and rigidly posed in a way similar to that of the Strike the Blood manga adaptation. Like StB the ability to draw stills of the character designs seems to be the main priority for the mangaka over anything else, although thankfully in Re:Zero the mangaka is at least a competent artist, with a grasp of creating contrasts and shading (unlike StB). Backgrounds, however, are extraordinarily plain and indistinct, a foremost example being the capital city’s “slums” which look like a normal street that an able bodied person with a sewing kit and a broom could fix up in half a day. The artwork lacks any real sense of place or wonder which really hurts it in creating a memorable world. In composition it is fairly pedestrian too, with the only saving grace being a couple simple, but effective, 2-panel action-reaction jokes which were a small highlight amongst the mediocrity. As for the story itself, the Re:Zero starts with a lot more promise than actual execution. Structurally it works well, covering the first two “lives” of Subaru’s respawning existence, allowing the audience to at least get a decent grasp on the main hook of the series in one volume. This is good, as other than that one hook the manga has not much else to really hang it’s hat on. The plot seems like a riff on the stuck-in-a-fantasy-game story (and possibly a parody of sorts of that formula), but one that barely gets anywhere with that premise in its first volume. The worldbuilding is minimal, and the characters themselves have only small hints to depths outside of their stock-stereotype molds. Emilia the half-elf for instance (only referred to as “Satella” so far) looks to be a hot tempered “tsundere” though there are hints of her being much more kind and gentle than could be expected of standard characters of her ilk. The spirit-cat Puck, roguish Felt, and the giant Rom are a bit more entertaining, being at least witty in their own ways, though none of them are particularly notable. And then there’s Subaru. Subaru is well, definitely not the sharpest tool in the proverbial shed, and in fact his definite case of thick-headedness is possibly his most surprising trait, breaking away from the mold of always “cool” and “on it” main characters. But while Subaru might be surprising in his almost absurd lack of situational awareness, reading him is sometimes just a trial in enduring awkwardness. Some of this is just the outcome of Subaru’s fairly perplexing penchant for theatrics (which seems out of place to me) while at other times it is just his stupidity that seems like too far a mental stretch. For instance, how Subaru can go around town thinking about everything in fantasy RPG terms, and yet not intuit the concept of a “respawn”? I have no idea. The most startling issue with the Re:Zero manga though was not one I never expected to have, and that was its use of the inter-chapter break pages. These extraneous pages often serve in manga just as convenient chapter dividers, either being bland and harmless Title Cards, or else extra space for extra lore or special artwork. 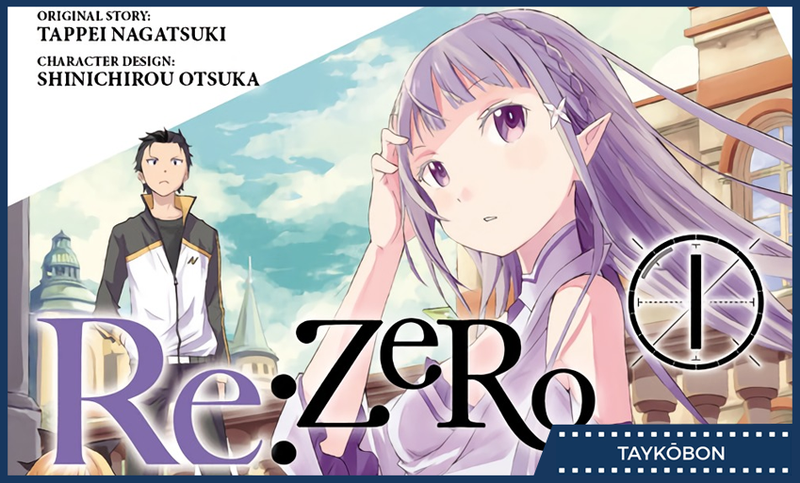 Re:zero for the most part uses the bland Title Card approach, with one exception, that of the break between Subaru’s first “death” and “respawn.” Here the manga editors found it “wise” to place a paragraph (which can be also be found on the table of contents page) explaining Subaru’s respawning power. In context though it doesn’t feel like a chapter divider, but rather like the mangaka didn’t have enough faith in their abilities to convey the idea of a time-loop or respawn to its audience as is. I personally felt it was an admission that the manga, wasn’t at all the original intended medium for this story, and that one page came to exemplify my feeling that adaptation was a poor conveyance of the original story’s ideas, and one that the mediocre execution did nothing to diswage. Re:Zero - Starting Life in Another World Vol. 1 is an adaptation of a series and idea that has signs of promise. However the few good ideas that it contains are squandered on a manga adaptation that while not actively terrible, is just merely passable on all levels. So if you were thinking about picking up the series, by all means try it out, though i might suggest looking into either the original novels, or the well regarded anime adaptation instead for your Re:Zero fix. Re:Zero - Starting Life in Another World Vol. 1 was published in English by Yen Press, on July 26, 2016, translated by ZepherRZ. The original work was created by Tappei Nagatsuki with manga art done by Daichi Matsuse. Volume 2 releases in English on October 25, 2016 .